Stamp it, colour it, dye it, punch it, stick it on, stand it up - it's up to you! 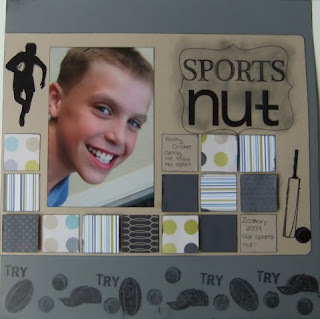 Your creation can be a card, scrapbooking LO or a 3D project. 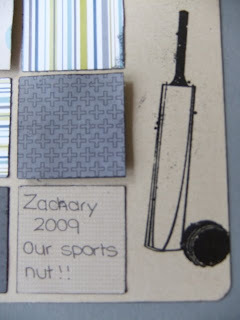 So here is my entry...a scrap page of my eldest Zac and his sport obsession. My husband and I joke that he only goes to School for the sporting opportunities. * I have heat embossed some of my images which adds some great depth. 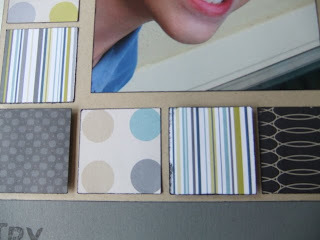 * I have also used Stampin' Dimensionals to pop up some of my squares on the layout. * Ink the edges. I have used my Black Stazon ink to edge everything on the page including my photo. Swiping the edges of your photo with Black Stazon adds great depth (especially when you are not matting your photo). I have gone for a bit of a grungy look with all the black ink on the page. I am not quite sure about all the crazy sponging around my title ...maybe it will grown on me. I traced around a template of a Top Note die from the Stampin' Up website using my Black Stampin' Write Journaller around my title as well. I used some of the stamps from the Just Rugby and Just Cricket sets for a random border stamped with Black Stazon across the bottom of my page. These stamp sets are just perfect for scrapbooking and making cards for my boys. 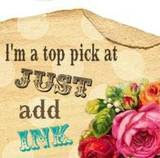 Thanks for stopping by and don't forget to check out all the awesome entries at Just Add Ink. Great layout! I like how you've used the DSP too. Thanks for playing!